Is it just me, or is that not just the funniest title? ...it's a recipe to THE most addictive and amazing appetizer ever known to MAN ... or JackSAN. Nonetheless, while scoping out pics tonite for Pookie's Star of the Week poster, I came across me doing the photo recipe / blog / thang to my favorite food - and what I'm hankering for tonite (even though it's way too late and I don't have any chips. ... believe me, if I had chips, it wouldn't matter how late it was...). Cook up some chicken breasts in the microwave (about 1.5 pounds). Shred or cut it up into teeny tiny little bits. Buy some Syberg's Famous Wing Sauce (if you're StL or can get it - no other sauce compares to Syberg's, I promise!). Pour it over your chicken bits. Spread a package of cream cheese on a pie plate. Spread chicken stuff over the top. 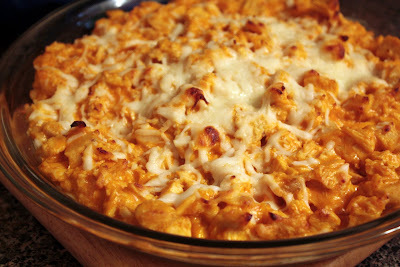 Grate some cheddar cheese over the top and heat in the oven for 15 minutes at 350 degrees. 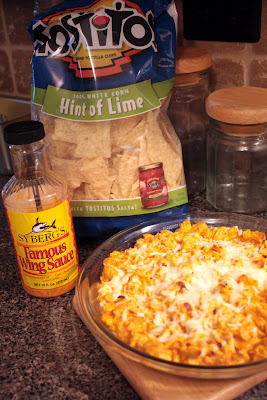 Serve with Tostitos Lime Chips if you're awesome like me --- or your favorite crunchy chip-type food. Big Daddy and I can make a MEAL out of this. And only talk about feeling guilty about it. We don't really - feel guilty - cuz this stuff is Dang Good!